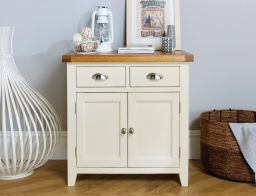 The stunning cream painted Country Cottage 80cm Sideboard. This sideboard is an excellent addition to our Country Oak Painted Range which we offer many different products in such as dining tables, bar stools and sideboards. 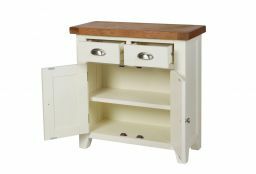 The Country Oak cream painted 80cm sideboard is manufactured with an American Oak top which is sourced from sustainable forests. The oak is then beautifully finished with an oiled wax which brings out the natural beauty and characteristics of the oak. Sideboard supplied fully assembled and ready to use. The build quality is great and really happy that we bought it. 2 points though: - The handles have all been screwed in with plastic surrounding them which I guess was to protect the handles but its a pain taking the plastic out as its been screwed in with the handles, haven't even been able to take it all out as I fear damaging the doors - We have a wooden floor and the sideboard was not balanced, had to put pieces of cardboard under one leg to balance it. As with the console delivered at same time the sideboard was exceptionally well packed. 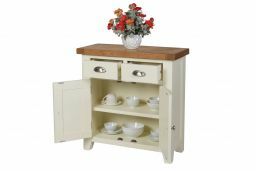 It fits well in the dining area of my newly fitted kitchen and is just the right size for the space available. I am very pleased with it. Fab little sideboard. Lovely quality. 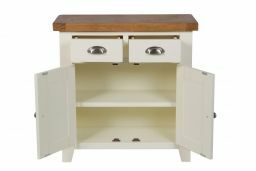 Paid half what I paid for a similar unit from Debenhams but this one is better quality. Really happy with it. Really pleased with the sideboard, great quality and exactly as described. Lovely piece well built. Compliments the tv stand I purchased. Be aware the colour is a deep cream, not a problem for me however. Looks so nice good quality furniture. Great piece of furniture solid and looks awesome. Delivery was on time if not a little early. Lovely item - quality wood and delivered promptly. Really pleased with the quality and look. It was delivered assembled in less than a week. Would definately recommend and use again. 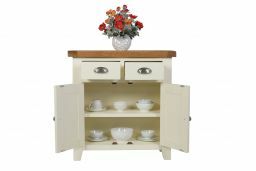 Delivery service very prompt and quality of furniture good. 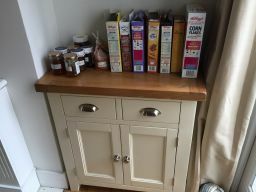 Beautiful cupboard fits perfectly and looks lovely in my country cottage..!! Have just opened up my order of two small sideboards. Am so so happy with the quality. It was brilliantly packaged. Perfect condition. What a great company you are! I will definitely buy from you again and will spread the word that you and your products are great. A beautifully made, eye catching piece of furniture. A steal at the price. Excellent looks so good beautiful. Came packed well and already made. It arrived this morning exactly on time as was arranged, so a bonus point there! On first inspection the sideboard looks well made and nice and substantial (chunky) and will fit well in our cottage style kitchen. Very pleased all round and would certainly consider buying from T-F in the future. 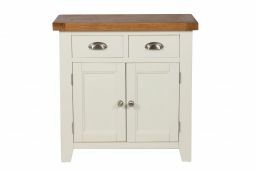 Delighted with my new sideboard & the other items I purchased from the Country Cottage range. The service I received from ordering through to delivery was excellent. 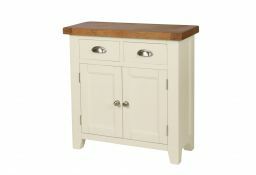 This is a beautifully made piece of furniture, very carefully wrapped and a reasonable price. A lovely piece of furniture. I'm so pleased with it. Fabulous cupboard, well made and arrived in perfect condition. Drawers slide out easily and it looks great. Easy to order and quick to deliver. Great service. Fabulous, very sturdy. Good quality. Very solid and well made. Extremely good service both ordering and delivery. Would certainly recommend your company. Over the moon with this product. It is top quality, solid and looks fab. Great customer service and delivery communication. Will be back to buy more. Very pleased! The quality of the furniture is excellent for the price. The chunky solid Oak tops really look the part, much better than the veneer tops offered by many other retailers. Other shops were charging double the price for similar spec/quality furniture.